Nicole Richie attended The Art of Elysium's 3rd Annual Black Tie Charity Gala on January 16th in Beverly Hills. Click on images for high quality viewing. Nicole Richie looked amazing in a beautiful printed maxi dress. I am not usually a fan of clutch bags but i adore Nicole Richie's red and gold clutch it is gorgeous! Nicole Richie's stylist Simone Harouche has informed me that the beautiful clutch is vintage Gucci. Nicole Richie gives us a sneak peek of her Christian Louboutin 'very prive' peep toe heels. 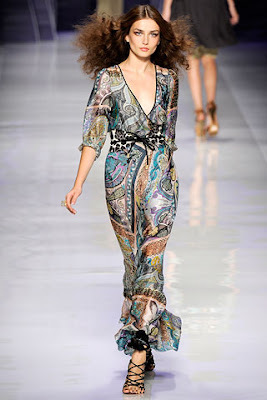 Nicole Richie's stunning printed maxi dress is from Etro spring 2010 collection. Do I spot a little make-up mistake, like the one Nicole Kidman had?